CHUMPHON, THAILAND—Burmese people living in a fishing village in Thailand's southern province of Chumphon have accused the local police of severe repression. In several interviews with The Irrawaddy, Burmese fishermen in Ban Pak Nam village said that the local police were often “laws unto themselves,” making raids into their living quarters without permission and sometimes even stealing inexpensive trophies such as cigarette lighters when they leave. “Their usual reason for raids is to search for illegal migrant workers, but they take whatever they want with them,” said Aung Aung, a Burmese migrant working at a food processing factory in the village. A native of Arakan State in the west of Burma, Aung Aung said he does not have any sort of documentation except for a small passport photo with the signature of his factory's owner. For this he is charged 300 baht every month. When The Irrawaddy met Aung Aung at a beer shop this week, the level of oppression suffered by Burmese migrant workers became obvious. On seeing a group of policemen coming inside, Aung Aung quickly took out his mobile phone and attempted to furtively slip it into the hands of a waitress for safe keeping. In this village, Burmese people—whether legal or illegal migrant workers—are not allowed to use mobile phones, bicycles or motorbikes, and are forbidden to wear good wristwatches or shoes. If caught using these things, they can face a range of fines. “If you are caught with an expensive mobile phone and want the police to return it, you have to pay 500 baht. Cheap mobiles cost 200 baht to be returned,” said a Burmese fisherman in the village who called himself Aye Maung. He insisted on keeping his real identity secret for fear of police reprisals. “You are fined 500 baht if you are found wearing an All Star slipper or a Citizen wristwatch,” he said, adding that the Burmese workers in the village have to pay the police 5,000 baht if they want to hold any sort of ceremony, whether it is a funeral or a wedding. “The police said it is for security costs. Now this has become almost an official procedure for any sort of gathering,” Aye Maung said. The fishermen even accused police officers of selling undocumented Burmese migrant workers to Thai boat owners at the price of 10,000 baht per person. These slaves are only released after having worked for eight or nine months at sea without pay, and an unfortunate few never come back again. 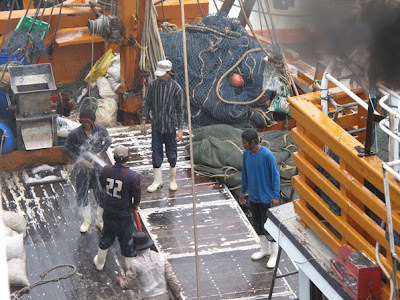 Apparently one of the five was shot dead by the boat master and thrown into the sea as he was not a good worker. Afterward, the four others were so fearful of sharing the same fate that they tied their hands together one night and jumped into the sea to escape. “They tied themselves because they wanted to keep themselves together whether they were dead or alive. But they all died,” said Aye Maung. In this village where thousands of Burmese fishermen are living—most of them illegally—there are no representatives of international or Burmese NGOs except the World Vision organization. But this group's activities are focused solely on health issues within the community. 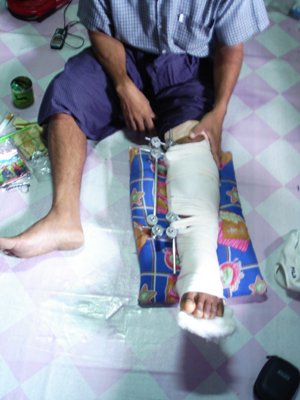 There are an estimated 30,000 Burmese migrant workers in Chumphon province alone. Even though there is no organization helping them, the Burmese fishermen sometimes fight back against these injustices. A fisherman who does not wish to be named said that he contacted the Bangkok-based Seafarers Union of Burma to complain about the monthly 200 baht every Burmese household is unofficially taxed by the police. The organization broke the news to the Burmese exiled media and the illegal taxation was promptly abolished in the village, he said. A local Thai woman in the village who spoke anonymously said that the Burmese community does not keep themselves clean, alluding to how the police might justify their heavy-handed actions. But she also denied any knowledge of the crimes the police were accused of committing against the Burmese. Meanwhile, in an area called Ban Nang Yon of Phang Nga District in southern Thailand, the local police force issued a law earlier this year that requires all Burmese migrant workers—legal or illegal—to wear the same uniform whenever they go out on the streets. They have to wear an orange color waistcoat which must be bought from their Thai business owners at a cost of 200 baht. These Burmese workers said that if the police caught them without a waistcoat, they were fined—a few hundred baht for a legal migrant worker or 3,000 baht for an illegal one. “You are fined even if your waistcoat's button is in the wrong place or if your waistcoat is dirty,” said Ali, a Burmese worker. Htoo Chit, the executive director of Grassroots Human Rights Education and Development, a Burmese local NGO, said that this new measure to manage the migrant worker population constitutes a serious violation of basic human rights. “This is what we only do to animals,” he said.